" We have purchased a variety of machines from Shawmut Equipment, including a Manitowoc 12000 crawler crane (120 ton), a Manitowoc 14000 crawler crane (220 ton), four (4) Grove RT890E rough terrain cranes (90 ton), a Grove TMS9000E hydraulic truck crane (110 ton), a National 9105H boom truck (27 ton), and a Grove YB7725 yard boss crane (25 ton). 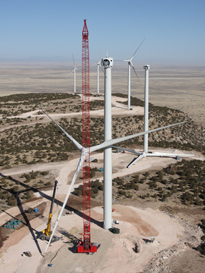 These cranes are reliable and stand up well, which is why we chose the Grove and Manitowoc products. Each machine fits a niche in our crane rental fleet and has worked out nicely for us in any job we put them on.
" I’ve been working with Shawmut for about 5 years. When we started working together, we were in the planning stages of growing our company. They have extremely good mechanics in our territory. You make a phone call, and you get an answer. Sometimes they are able to troubleshoot the problems over the phone. If not, the mechanics come out to our jobsite and complete the repairs for us. My salesman at Shawmut, Joe Vergoni, always makes sure that I get the parts I need and that my questions are answered quickly. 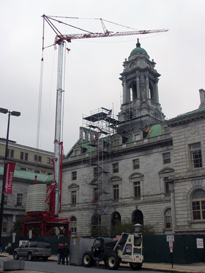 The first time we ordered from Shawmut, we ordered three cranes at once, because we needed them for three different jobs. It worked out perfectly for us, and our relationship with Shawmut has grown from there." A.W. Leil Cranes & Equipment Ltd.
"Shawmut has been my dealer for nearly 11 years. They’ve got an excellent staff that will really bend over backwards to make something happen for you, and they are reliable. They have responsible people working at their locations who follow up and make sure things happen when they’re supposed to. Anything mechanical eventually does break. Their service is excellent, and they have a fantastic reputation throughout the U.S. and Canada. My salesman at Shawmut has been helpful in every way. It is a big advantage to have a great support dealer to deal with like Shawmut Equipment. They’ve been excellent as far as service work goes and for meeting our needs. It’s really been a pleasure working with them." "Shawmut has always been great whenever we’ve needed someone on the job site. While on site, downtime is unacceptable because you’re never in a good place to stop. It is critical that we have direct access to someone who can get us out of a tight situation. They always assure us that we will get our project completed and be able to travel home without leaving our crane behind. Usually Shawmut can maximize uptime by talking us through a problem over the phone, even though they are not sitting in front of it. This says a lot about their knowledge of their equipment. If a Shawmut employee can’t fix the problem over the phone, we know that someone will drive out to help us. One time we received a call to do some emergency work at Central Park in New York City. 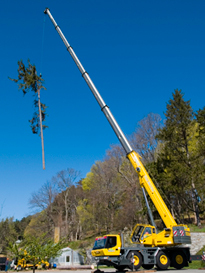 In New York you have to have a New York City certified crane and operator, meaning your crane needs to be inspected to work inside the city limits, with the same requirement for the licensing. My salesman at Shawmut found us a contact in New York so we could use their equipment and operator. The company was able to provide us with the same machine we would use at home – a GMK 3055. We provided the personnel, while they provided the equipment, and it worked out great. Without Shawmut, we would not have been able to complete the job."